I didn’t sleep much the night before. I was too excited because the only driving that I was to do today was to trailheads. We couldn’t have picked a better place to interrupt our seven-day streak of filling the gas tank at least once daily. Moab. Where the mountain bikes roam free. Where the dune buggies parallel park in front of the ice cream shop. Where muddy clothes are socially acceptable yet infrequently spotted. Where I got a haircut - at Legends Barber Shop. It’s also a place where I was reminded of the differences between road bike culture and mountain bike culture. While I can't, for the life of me, understand the whippet-looking, metric system-using, Strava-worshipping road bike culture I do identify with them more for the following reason: when I turn into a parking lot and successfully stop, I don’t do it again to show my friends or break out the GoPro to tape them doing the same maneuver. Likewise, when I look at a map and realize that my hotel is only three and a half miles to the legendary SlickRock Trail my first impulse is to #choosethebike. This was one of those times it’s wrong to #choosethebike, and I blame my road bike mentality for my error. 3.5 miles is a warmup on a road bike. 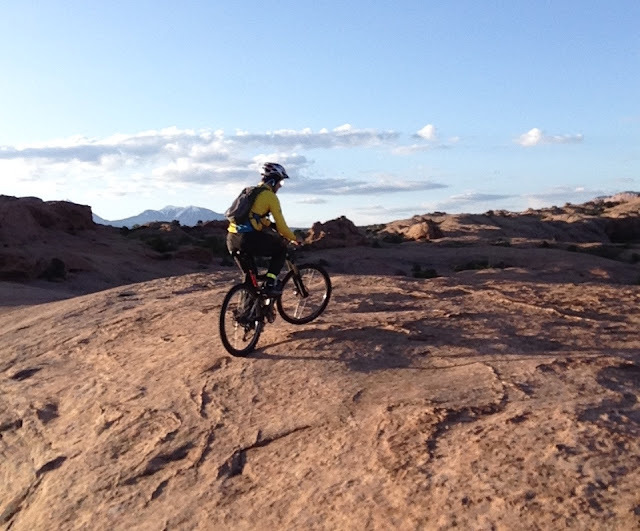 In Moab, 3.5 miles - almost completely straight up - requires a full stomach, first-aid kit, spare tube, patch kit, wire ties, tire levers, minitool, pump, paper towels, crescent wrench, Otter case for the iPhone, signal flares, a half a gallon of water and snacks. I’ve found the key to climbs like this - especially if you didn’t drink any coffee or eat anything before leaving the hotel - is to slow your pace as soon as you feel like you are going to die. Also it’s good to occasionally look down to see how far you’ve come. Every time I thought I neared the top it seemed like more road stretched ahead. Eventually, I arrived at signs indicating that I was very close…and I realized that whoever named these trails was equally inventive as the Kingdom Trails people in Vermont. Shortly after passing this sign I passed a campground with about a dozen RV’s on the left and came to the SlickRock bike trail parking lot that had only two cars. It was, after all, pretty early in the morning on a weekday. Even though I was pretty tired from my climb and wanted coffee, I pedaled eagerly inside. 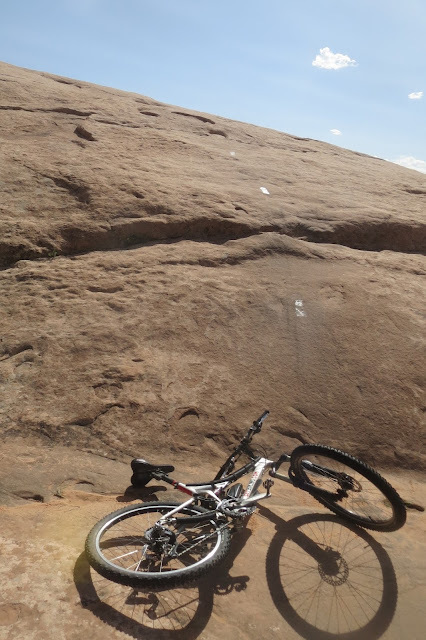 No matter where you’ve mountain biked in the past nothing really prepares you for the SlickRock trail. I felt as though I was riding along the contours of an asteroid or a three-dimensional Salvador Dali painting of sand dunes. The sandstone isn’t ‘slick’ and my tires had plenty of grip as I bounced toward the sunlight. And when I got there, the landscape took my breath away. The SlickRock bike trail has to be seen to be believed. It is the most otherworldly place I have ever ridden and just an extraordinary place to ride. After taking this one selfie, I blasted back down the hill to the hotel and finally had coffee. I rejoined my wife and after breakfast we drove into Arches National Park - which is among the many national parks in the U.S. that is endangered by the massive numbers of cars that lumber through each day - especially in the summer. We learned that a new parking lot had been built in the park to accommodate more guests, but even today it was quite full - and I hope it will eventually go the route of Denali National Park in Alaska and only allow buses through. We did a nice hike up to the arch that is featured in Utah’s license plates (and, hilariously enough, on the back of a Cruise America RV we followed into the park). When we stopped to rest, my wife sketched Delicate Arch while I just marveled, took pictures of tourists taking pictures of themselves in front of the arch, and marveled some more. Later that afternoon, when we were done with our hike, we returned to downtown Moab and enjoyed some pretty extraordinary quesadillas from the Quesadillas Mobilla food truck. If you go to Moab, it won’t be hard to find. Thus fueled, I returned to SlickRock trail. Only this time, I brought my car and my wife - who said she’d sketch the bikers while I rode on the trail and send a search party if I didn't come back before nightfall. I rode on the big loop first until I realized I’d never be able to ride the full 13 miles before we’d have to go to dinner. I slowly let go of the road bike mindset, turned back, and hit the practice loop - which didn't seem less difficult, terrain-wise, as the main trail. It was during this period I realized I was putting an incredible amount of faith in the mountain bike I had built. However, it had served me well up to this point and the Avid brakes I had installed after my disaster in Vermont with the ‘RC Cola’ brand equivalent, I could go very slowly on downhills, which on a lot of stretches is necessary. However, it put a lot of strain on my back tire and my valve was unexpectedly severed by the rim of the bike on one of the downhills. The sudden sound of air rushing out threw me off my game just a little. I wasn’t hurt when this happened. In fact I bailed onto my feet - graceful and cat-like I’m sure - when I reached to the bottom of the hill. However the tire was irreparable. Lucky for me - and a must for anyone attempting to do this on this trail - I know how to fix a flat tire (and, accidentally separated from most of my mountain bike kit when I moved out of my house in Connecticut, I had a spare tube bought the day before at University Bikes in Boulder). I may take this photo and put big, old fashioned cursive letters on it that read: Greetings from Moab! Sitting next to a cactus, in almost complete silence, I fixed the tire in less than ten minutes and continued on. I wished my cousin, the Mountain Bike Jedi Master himself, was there with me. Mostly for the company but also so I’d have someone to ride ahead of me so I could see how he’d handle the terrain. While we’re on the subject of my cousin: he was also helpful in putting me in touch with a couple of area friends of his who knew the trails well and wanted to give me advice where to go. Both, who didn’t know me from Adam, sent me detailed emails - which I thanked them for profusely and shall keep for future reference. I rejoined my wife, made her swear not to sell her beautiful sketch of the mountain bikers to anyone but me, and we put the SlickRock trail in the rearview mirror. But I'll see it through the windshield again someday. Click here for Morning 7.